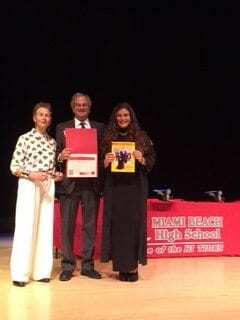 The third annual Carole Taran Award for Excellence in Performing Arts at Miami Beach Senior High School was presented to senior Stephany Arbelaez, a superbly talented performer who was selected for the award by the faculty of the Fine Arts Academy at Beach High. “Stephany is an extremely talented music student and performer, with a wonderful voice,” said Nina Duval, Lead Teacher and Fine Arts Chair at the high school. Stephany will be attending the New World School of the Arts at Miami Dade College in the fall. Stephany is a veratile performer who can take on any role as an actress, instrumentalist, or singer. 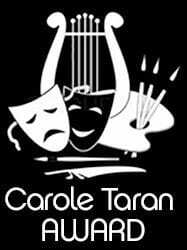 She sang in school and community theatrical productions, and also with Beach High’s Rock Ensemble. During high school Stephany performed in seven school productions, as well as in numerous public service, nursing home and homeless shelter events, positively impacting the lives of many people. Stephany has also actively participated in many Brazilian Club functions, spreading awareness of Brazilian culture throughout South Florida. Beach High has become well known for its first rate fine arts programs, with numerous dramatic and musical performances that have been a credit to the school system and the entire community. The 2016 Senior Awards Ceremonies were held on Wednesday May 25th at the Beach High Auditorium and the “Carole Award” was presented to Stephany Arbelaez at that time. Stephany received a Certificate and a $500.00 scholarship check, courtesy of 1308 Productions, a non-profit music advocacy organization. Stephany was humble, thrilled and excited about the recognition and scholarship award. 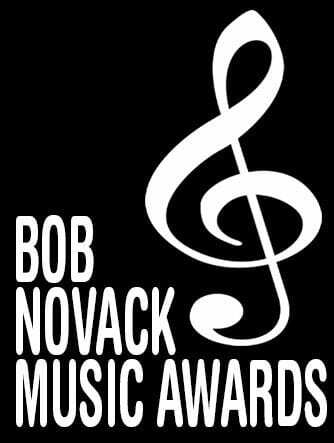 The annual award is presented by 1308 Productions, a non-profit and public service music education advocacy organization founded and led by former Beach High students Jason Novack and Allison Novack, Carole’s nephew and niece. The award is in honor and memory of their aunt, Carole Taran Lee, also an alumnus of Beach High. The award was presented to Stephanie by Carole’s brother Paul Novack.